Moscow is a very beautiful city and it is the home of Marina Osetrova of Marina Osetrova Bears. "I was born in St. Petersburg. When I got married, I moved to Moscow." It is there that she and her husband started their family which, in addition to now having 2 adult children, includes 2 grandchildren and a Vice World Champion and International Champion canine named King. 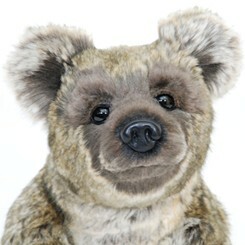 Marina is relatively new to bear making, although it does not show in her work. "I started to sew teddies only 4 years ago, but I liked it so much that I can't seem to get on to other things." Her bears are cheerful little fellows, even sometimes "pranksters." All of them have character and their own histories. When asked how she began in her love and artistry of teddy bears, Marina said, "My daughter-in-law, Yaroslava, made teddy bears. I was curious to know how it all worked and I gave it a try. The first bear was ugly (in my opinion) but I decided to keep it. I tried to sew bears in different styles and after many attempts, I realized that I like the bears that look like they are real. I like teddies where you exclaim "They're alive!" 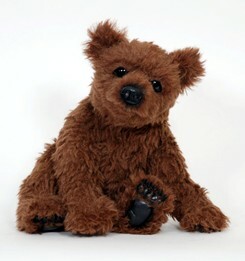 Marina's bears feel warm, soft and have leather paws that make them seem alive. They are easy to pose in natural positions that it is often hard to tell whether they are real or not. She designs all the patterns by herself, creating teddies with eyes and mouths that open and close. Their mouths have teeth and a tongue which resembles a live bear. 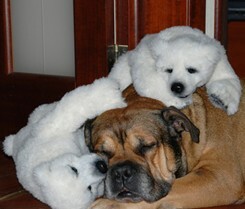 Even her dog King puts up with these life-like bears when they cuddle with him or misbehave. Marina takes part in many exhibitions and fairs held in Russia and in Germany, often receiving top awards for her work. "My bears have found homes in Russia, America, Japan, China and Germany, just to name a few countries." She sells them at trade shows, on the Internet and from her web site. 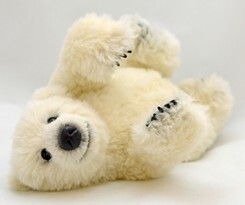 "Many owners of my bears send me photos and tell me about the lives of their bears. 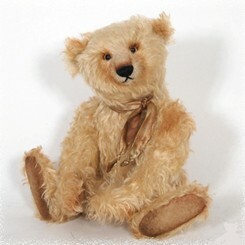 Therefore, collectors of my bears often become my friends which is very nice for me." And as Marina travels around with her bears, she sometimes experiences issues in customs with her luggage full of bears and prizes. "I take my prizes and bears in my carry-on luggage so that they do not get damaged during the flight. At customs, they always ask me, "What do you have in the bag?" I say, "Bears!" at which they reply, "Show me!" "As a new person discovers the joys of bears, I think the custom officers do not work! All they want to do is play with my bears! Then everyone smiles and everyone is in a great mood." Marina clears customs easily then. "This is the most important thing for me. I love when my bears bring out the kindness and warmth in the soul of everyone. I make them with love." Sometimes Marina thinks she must be living in a fairy tale. 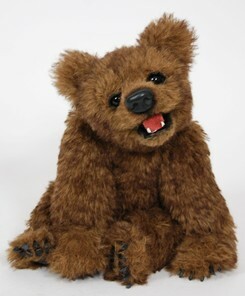 "I think at times that I will make a particular type of teddy and it seems to smile at me and say, 'No! I am a different kind of bear.' Bear pieces seem to direct their own creation." Marina feels she brings a fairy tale to life with each bear that is born from her hands and that warms the heart of another. "I want you, having taken my bear in your hands, to keep it close to your heart and have it become your favorite teddy." 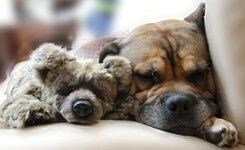 By holding and caring for one of Marina's bears you know the fairy tale ending has come true for you both.